Several methods of tool grinding - Purros Machinery Co.,Ltd. No matter what kind of cutter, after a certain period of use, it will be somewhat different from the prototype, which is not as smooth and sharp as it was when I bought it. In order to keep the cutter in its original shape, some grinding operations must be done, which can obviously remove the residue on it, make the blade tip sharper and effectively improve the speed of operation. Different methods should be chosen according to different types of cutter. Hollow Grind: a groove is excavated on both sides of the cutter surface of the shaping cutter and other cutting tools. Because it is easy to process and design, many factories in the market use this grinding method. The advantage is that this grinding will result in a very thin blade, and the thinner the blade the better. Its drawback is “thinner blade is more fragile”. Chisel Grind: There is only one side to grind. The advantages are as follows: 1. Easy to process: one side grinding only needs half of the other grinding methods, and does not need to be too precise, so it saves time, labor and money. 2. Easy to grind: Only one side is needed unless there is serious damage, and the grinding technique need not be as advanced as other grinding methods. 3. strong blade: only a single edge, so the blade angle is large (about 30-45 degrees), and the blade is thick. 4. Save material: In the early hammering knife era, this kind of grinding method does not need to be like other grinding methods to generally remove excess steel, can save the most steel consumption. There are three drawbacks: inaccurate cutting: when you cut apples with chisel grinding and other bilateral grinding knives, you will find that the two-sided grinding knife can cut the apple in two, and the chisel grinding knife will go out with the grinding angle. 2. Unable to puncture too deep: chisel grinding on the tip of the knife caused too much inclination, making it puncture on the formation of many obstacles. 3. Grinding surface error: right-handed knife grinding mode is (from the knife back down) the left side of the knife surface is flat, the right side is grinding; left-handed knife just the opposite. However, due to the differences in the traditional display of knife face and the usage of knife, most of the chisels made by Western knife factories are left-handed knives. When the blade is cut outward, the cutting angle of the knife must be increased to be used smoothly. Flat Grind/V Grind: a grinding method for both sharpness and solidity. The back of the cutter, such as the shaping knife, has been ground to the blade from the beginning, so it has a fairly solid back and blade. Saber Grind: Similar to the plane grinding method, they are both sides of the knife face without grooves. The difference is that the surface grinding method runs from the back of the knife to the blade, whereas the cavalry grinding method runs from the half. It also has excellent cutting and splitting ability. The early cavalry knife is the form of grinding, so it is called cavalry grinding. Convex Grind: Also known as Moran Grind, Bill Moran is the best western master at developing this Grind. This grinding method is different from the above four grinding methods. The other grinding method is to form an inclined surface or groove on both sides of the knife, while the circular grinding method is to form a pair of convex arcs above the blade (also known as the blade in Japan because of its length like a hard clam). This type of grinding is as hard as flat grinding and as sharp as concave grinding. For a very difficult way of grinding. The downside is that if you don’t have a flat-belt Grinder, it can be hard to grind on your own when the blade is blunt. 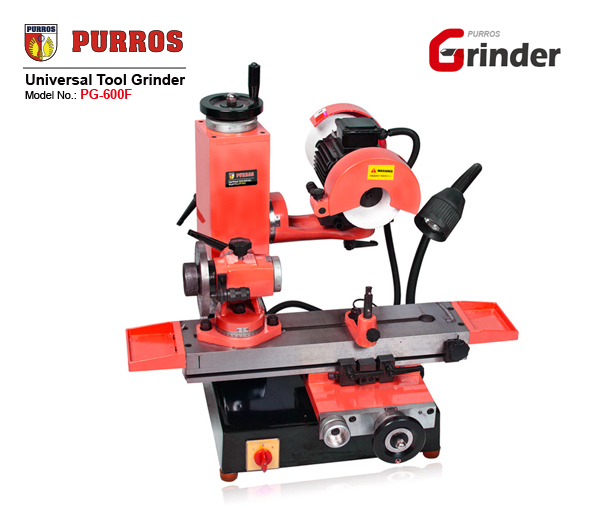 Most cutting tools can be sharpened with PURROS Universal Tool Grinder. Welcome to consult related products. Posted in Technology and tagged advantages of grinding, Cheap Universal Cutter Grinder, chisel grind, Convex Grind, Flat Grind, Hollow Grind, PG-600F universal tool grinder, Saber Grind, tool grinding, Tool grinding method, Universal Cutter Grinder Manufacturer, Universal Cutting Tool Grinder, Universal Grooving Cutter Sharpening Machine, Universal Scoring Blade Sharpening Machine.